Makes software for the logistics industry that helps companies plan and execute shipments of all kinds. During stints as a freight broker and shipping consultant, Brad Hollister saw firsthand how the systems big manufacturers and retailers used to manage their shipments were wildly outdated. To save them time and money, he started SwanLeap, which uses artificial intelligence to make sure every parcel, container, and truckload goes out under the best available rate. Custom software integrations give shippers a level of visibility into their supply chains they’ve never had before. SwanLeap says its customers that had been spending seven or eight figures per year on freight are now saving an average of 26.7 percent thanks to its services. 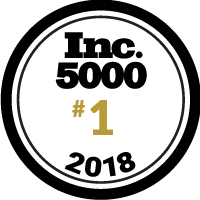 @theswanleap team is honored and proud to be recognized as one of the fastest growing companies in America for the 2nd year. Thank you!